Background: Orodispersible film (ODF) is a novel drug delivery system and most widely used dosage form because of its convenience in terms of self-administration, compactness, and ease in manufacturing. Lutein (Carotenoid) is an antioxidant, belongs to class II (High permeability and Low solubility) under BCS classification. To enhance the solubility, a solid dispersion of Lutein was prepared and then it has been successfully fabricated into ODF to increase its pre-gastric absorption, reduce its first pass effect and avoid further degradation in gastric acid. Objective: The objective of the present research work was to prepare a solid dispersion of Lutein in order to increase its solubility and formulate its ODF to improve its bioavailability. Method: The solid dispersion of Lutein was prepared by a solvent evaporation method using Soluplus as a carrier. 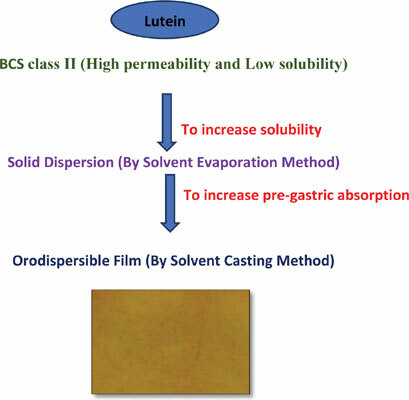 The orodispersible films of Lutein were prepared separately using different concentrations of Ethocel E 15 and Aerosil 200 pharma grade by a solvent casting method. Results: The prepared films were evaluated for various parameters such as folding endurance, drug content, disintegration time, in vitro drug release etc. The formulation F3 containing 150 mg of Ethocel E 15 and 20 mg of Aerosil 200 showed rapid disintegration time and in vitro drug release. Conclusion: ODF of Lutein has been successfully formulated. The developed formulation can be used for the treatment of age-related macular degeneration. Lutein, solid dispersion, orodispersible films, soluplus, lutrol E 400, sucralose.